Let me first tell you…I’ve been shooting with the Blackmagic Cinema Camera (BMCC) with the EF mount for over 7 months now, so all the little quibbles that people will have with the Blackmagic Pocket Cinema Camera (BMPCC), I have gotten used to, over them, or I’m patiently waiting for them to fix. These include: lack of frame rates over 30p, lack of good audio, no audio meters, no custom white balance, limited shutter angles (shutter speed for you DSLR folks), and no formatting or deleting in camera, each of these lack of apparent features I can now defend a little bit in the BMCC. I pre-ordered the Pocket Cinema Camera from a couple manufacturers. This particular camera came from Adorama. The box in my opinion is not as nice as the BMCC’s box, the camera was packed without a protective wrapper around it, they did get fancy and put a screen protector on it. The software and manual are delivered on a SD card which I think all products should do from now on, and no, you can’t use the card to record anything with the camera. In the box was the camera (thank goodness), the software SD card, the AC power adapter (there is no charger for the battery, this is for charging the battery in-camera…stupid idea), the battery (finally! A removable battery, and it’s an easily found cheap battery, the Nikon J1’s EN-EL20), there’s also a thin camera strap, which I promptly tossed to the side, I hate camera straps – good way to get tangled up and die. My first impression of the camera was that it was solid. 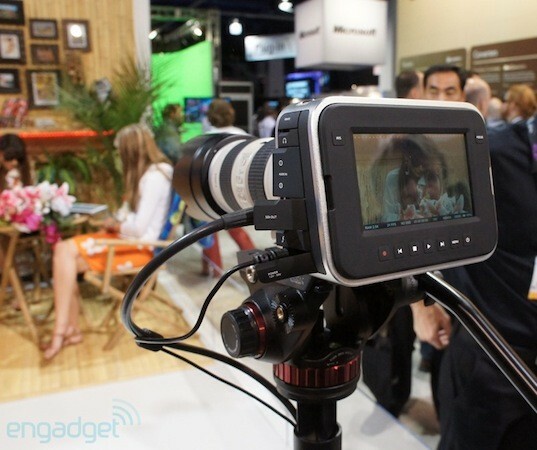 The build quality that they started with the BMCC is carried over in the tiny pocket rocket. The slightly rubbery coating on the outside creates a nice solid feeling in the hand. On starting it up, I found that the screen is now a matte finish, I really like this for exterior filming since I’ve had issues in the past with the highly reflective screen on the BMCC when shooting outside. They also scrapped the touch screen. Now most people would say this was a good thing, I’m on the fence and here’s why: I’ve spent the last 7 months with the BMCC which is touchscreen, and have found that it’s very fast. Toggling through a bunch of tiny little buttons in the menu seems to take forever without being able to touch the screen, and in reality, it’s no slower choosing menu settings than it is on any DSLR camera. For any kind of serious shooting I would still hook it up to an external monitor or EVF (via the mini HDMI out), or at the very least, a loupe (which for the size of the screen, there’s really no good option yet). I’m not a huge fan of the screen’s resolution, it’s quite low in my opinion, and wish they had gotten the same type of screen used in the Alphatron EVF or iPhone. The battery life is horrendous – expect to have at least 4 batteries on you at all times and turn the camera on and off to get through a day of filming. You’ll also want a battery charger since the camera doesn’t ship with one. MEDIA: The camera does take very fast cards to record, which cannot be formatted in camera, nor can clips be deleted once they are recorded. You will need plenty of fast cards and they have to be faster than 41mbs. Thankfully when the camera came in, BestBuy was running a sale and I picked up two Sandisk Extreme 32gig cards. Once the raw recording is turned on I’ll jump up to the 128gig cards, I think, since it’s a huge data hog. LENSES: For people coming from a 5D or another DSLR, the crop factor of the camera can be extreme. 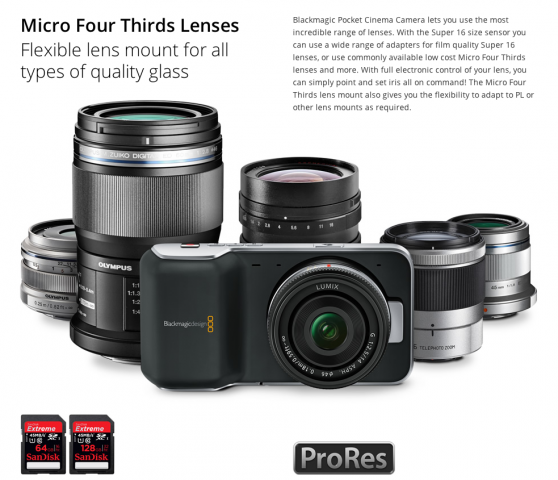 The original Blackmagic camera has a crop factor of about 2.3x, the pocket camera has a Super 16 crop factor of 3x. So, your 50mm lens becomes 150mm. Finding wide lenses will be fun with this camera, but with the sensor size being a normal size, some obsolete lenses suddenly have new life. I did try out the Olympus 9-18, and there’s some distortion at the wide end, but it seems to be plenty wide. For my native glass shooting I would love some spendy glass, but right now I only have the Panasonic 20mm F1.7 (lovely on the camera), the Olympus 14-45, and the Panasonic 45-200. I have an Angeniuex cinema zoom lens (a 15-150mm F2.8) on the way as I type this, as well as the lens adapters for all my legacy glass. Further testing will be fun to do. IMAGE QUALITY: The image quality, as mentioned by many others, is great. It’s not as sharp or as good as the BMCC, but definitely out paces the rest of the cameras in its price bracket. It records direct to ProRes 422, so it’s ready to edit. There are some major issues with the first cameras though. Some of the first batch are experiencing a blooming sensor – white orbs that appear on the highlights. My camera does display them, but they are easy to avoid. I think after a couple weeks I’ll send it in for recalibration. As with the BMCC when it first shipped, the pocket camera has the black sun – the sun, when in the shot, will appear as a black dot. As of today, there was a software fix that was released that fixes this issue. AUDIO: I have yet to do any real testing with the audio. There is a lot of handling noise with the internal mic though. Just like the BMCC, there are some audio issues though and I highly recommend a second system. The first thing I shot with the camera was my caribou hunting trip. Normally, since every bit of weight matters when hunting, I’m unable to bring my larger camera. The pocketcam, on the other hand, was the perfect size to slip into my jacket pocket and film some little bits with. I did notice in the early morning that I had some black “dead pixels” show up on the screen. The longer I ran the camera though, they slowly went away and I haven’t been able to duplicate it since. As the weather gets colder around here, we will see if the problem returns since I think it had to do with the cold, and not the constant rough handling on the ATV. I still haven’t shot anything serious with the camera, but hope to do something soon to really test it in a narrative or doc style shoot. I think it’s a fine camera for B or C camera or for rigging in odd places. The price point is very attractive to people, but most people don’t think about all the expensive accessories one needs to get it up and running. Expect to put double the amount that you spend on the body into the stuff to make it record. You also won’t be able to get the most out of the sensor without some serious lenses. With a native ISO of 800, you also want some great NDs. For people wanting something…simple, I’d still go with a traditional camera or a DSLR (as much as I hate to say it). 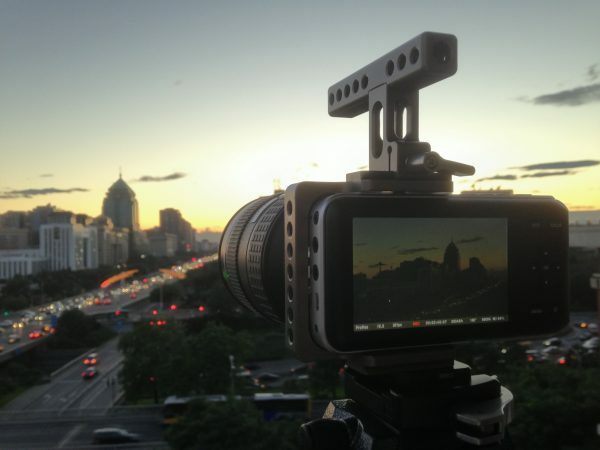 The BMPC is very much a camera built for filmmakers – it handles like a traditional film camera with its image capture and the way you need to think about your shoot ratios. It’s a small powerful camera, and in the right hands could be a great tool…and for many, it’ll be a headache as well. About the Author: Michael Bergstrom is a co-founder of Electric Igloo, a local production group. He is currently producing the second season of a popular Animal Planet show. He can be reached at mkbergstrom@gmail.com for further questions.